Just in time as I turn 70. I read this book about 5 years ago. I loved it. The basic premise is that our body is a product of evolution. We were designed for hunting, foraging, and later farming. In cultures where the population adheres to this lifestyle there is much less decay and dysfunction. The principle author Henry S. Lodge , MD noticed how so many of his elderly patients were becoming increasingly unhealthy and unfit. This was manifest in back pain,, neck pain, depression, obesity, and other ailments. They required prescription drugs to control blood pressure, anxiety, cholesterol and a host of lifestyle related problems. With his medical background he knew the research supported the fact that it was possible to reverse the effects of a sedentary lifestyle by returning to our ancestral ways. We evolved to move. The famous fish called the Sea Squirt spends the first part of his life as a fish. When it attaches itself to a reef and stops moving, it digests its own brain. It essentially becomes a plant. It is a clear case of ” use it or lose it “. I am a regular exercise fan. I have done many endurance races, including 18 short distance triathlons, a couple of marathons and a few 10 mile swims. Despite this I was nowhere near the level of exercise that was recommended in the book. They recommend 4 days of 1 hour of cardio and 2 days of intense weight strength training. Like so many people I found that I lacked the motivation and discipline to workout at this level consistently. I trained just hard enough to finish my races.. I did notice that my times were getting slower and I was doing more run /walk. My heart rate was too high. Despite my regular exercise I could see that I was getting slower as well as older and less able, just like everyone else at 69. I just started at a little higher level of fitness. We all know of people who don’t look or act their age. Some are just genetically fortunate. They chose the right parents. Others have to compensate for average and poor genetics by improving their diet and exercise. I have a colleague who at 79 is still hiking through the Dolomites in Italy and trekking across the El Camino a multi week retracing of a famous pilgrimage from Spain to the coast of Portugal. It is hundreds of miles. His brother has heart disease and is basically sedentary. Same genetics, different lifestyle. There is term used in the book called “Kedging”. It refers to the tactic of olden time sailors who set out their anchor several hundred yards from their becalmed ship. The sailors would then pull the ship towards the anchor. This was a metaphor for setting a goal. I needed something that would motivate me to do a daily program that would enable me to achieve the goal and incidentally require rigorous daily exercise. I already was concerned that my yearly triathlon times were getting slower and the effort was greater. Indeed I was feeling older and at this regression I would probably do what most people do. I would throw in the towel and accept that I was getting older. How many 69-year-olds do triathlons? Even short ones. In the tri world your age category is determined by your age at the end of the year. So in Sept 2018 I would be 70 so the whole year I would be the youngest in my age category. At 69 I would compete in the 70-74 age group. This would be the best chance to do better than I had done. With a little extra effort I could perhaps be in the top three and get on the podium. I started getting juiced. I joined a triathlon club, the Bay State Triathlon Team and did a second sprint triathlon with that group. I was like a fish being reeled in. The more I talked with other triathletes, the more interested and excited I got. The club has a yearly party where I did nothing but talk about gear and upcoming triathlons. I met Rich Hatch who is an endurance distance trainer. We hit it off well. It was all coming together. What event should I choose? It needed to be challenging so I would have to work harder than I had been. I looked at the longer triathlons. The next level up from a short distance sprint was an Olympic triathlon. This is a .9 mile swim, a 26 mile bike, and a 6 mile run. This is longer than I had ever done but it had no panache, no excitement. There is a long distance endurance race that I was amazed could be done at all. It’s a 2.4 mile swim, 112 mile, bike, and a marathon to finish. It has to be done under 20 hours. This is called the Ironman. This was a good Kedge. Did I have the time and fitness to train for such a drastic increase in swim, bike and run? If I was retired I might consider it, but it was totally beyond me. Who has an extra 20 hours a week for the challenge working full time? Not me. There is a half Ironman which is exactly half the distance. This means a 1.1 mile open water swim in the ocean, a 56 mile bike ride, and a half marathon at the end. My new coach said it would require about 10-12 hours training for 6-8 months to have a reasonable race. This was about 3 times my current workout level. It was a scary but exciting challenge. I would have to commit several thousands of dollars as well as most of my spare time to get in this level of training. I was already committed to a professional Feldenkrais training that required 40 days of training each year. I was enticed by the fact that It would be another 5 years to be the youngest in my age group. How bad can it be? I hired the coach signed up for the Maine 70.3 mile Half Ironman. and started training on Jan 2, 2018. The training was 7 days a week, with a day off every other week. I had to get up around 5 AM, and sometimes earlier, to get the workouts done. Some days I had to do them after work. It is real test of one’s grit. I had to overcome multiple body issues as I ran, biked, and swam more than I ever had done before. There were times that I was exhausted and questioned my sanity at setting such a difficult goal. As you can guess I did complete the race in August of 2018, one month before my 70th birthday. I experienced a peak moment, I will always remember. It was all gain and no pain. Well maybe a little pain. In the process I got to resolve, knee, back, neck, and shoulder issues. Resting heart rate went down, fitness , and endurance went way up. Having achieved this challenging goal was a great way to face my seventh decade. Indeed I felt the most fit in my whole life. I now have 5 years to be the youngest in my age category again. 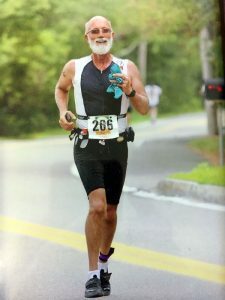 The next goal at age 75 is to complete the full Ironman distance of 140.6 miles. 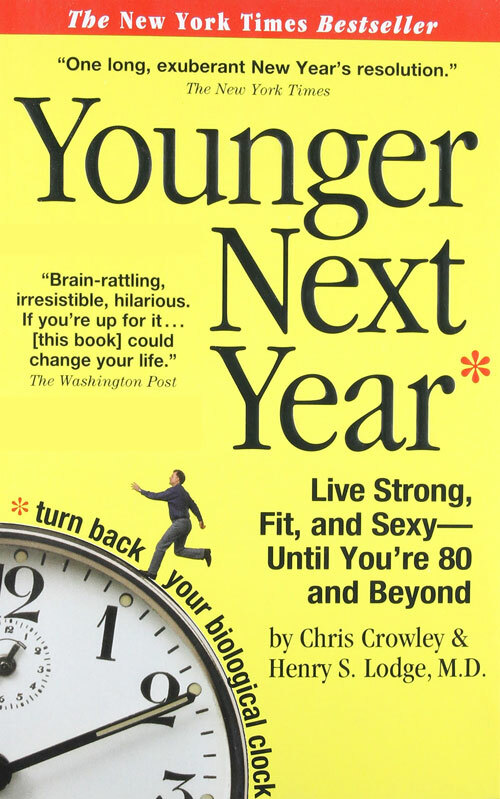 The quest for “Younger Next Year” continues.